Only one of 15 edible products tested by OG Analytical, a cannabis testing lab in Eugene, contained accurate potency information on its label. When you take any kind of medication, you usually pay attention to the dosage so you take the right amount for desired effects, right? After all, you want your headache to go away, or your allergies to be under control so you can function. But what if that label was lying to you? 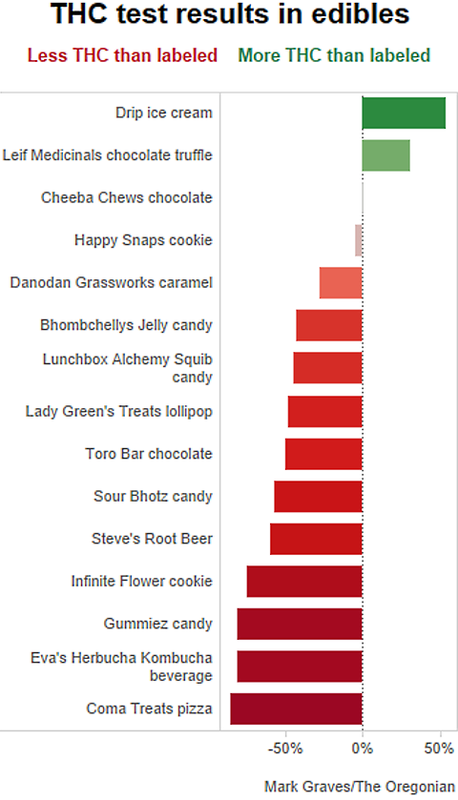 A three-month investigation undertaken by the Oregonian/Oregon Live has found that when it comes to the potency of some edibles on the market in Oregon state, package promises are mostly inaccurate. According to the findings, responsibility for this problem mostly rests at the state level. While Colorado tightly regulates the labs responsible for testing recreational marijuana potency, the publication asserts that Oregon has “an estimated 19 labs operating without oversight or clear scientific standards.” Ouch. To test potency, labs measure the amount of tetrahydrocannabinol (THC) per serving of each edible product. Colorado’s regulations define a single serving as 10 milligrams of THC for recreational users, while having no recommended serving size for medicinal users. Oregon does not currently have a set definition of serving size, as the Oregonian/Oregon Live points out. The entire report is a very interesting read, and is highly critical of the state’s testing practices. It argues that the lack of a clear set of standards for testing marijuana potency in edible products is to blame for these highly misleading labels. The 19 labs that test edibles in the state each operate according to their own highly secretive sets of procedures for testing. So if you’re an edibles producer, and you decide to have your products tested at two or more labs, you may end up with two or more completely different results. The Oregonian/Oregon Live consulted with Andy LaFrate, president and owner of Charas Scientific in Denver, CO about Oregon’s situation. LaFrate said that even otherwise reputable labs staffed by experienced chemists may produce inconsistent results. The full report includes a much more detailed analysis of the edibles tested, including milligrams of THC found in each item tested, as well as actual details of the testing procedures involved. While marijuana legalization and regulation is still in its infancy, setting some kind of standard is important just from a consumer standpoint—particularly for those who haven’t been blazing since high school. In our increasingly litigious society, sad stories like this class-action lawsuit against a Colorado maker of chocolate edibles could potentially be avoided with better labeling and more accurate information given. Case in point: When a NYT reporter ate weed candy and thought she was going to die.